Miguel Nunez Jr. and Shaun Robinson at the birthday party at Blu Beverly Hills. Shaun Robinson and Tyrese Gibson at the birthday party at Blu Beverly Hills. Shaun Robinson at the 2008 BET Awards. Nancy O'Dell, John Salley and Shaun Robinson at the birthday party at Blu Beverly Hills. Shaun Robinson and Kenny Aronoff at the birthday party at Blu Beverly Hills. Shaun Robinson at the 2008 CineVegas film festival. Tomika Fraser and Shaun Robinson at the birthday party at Blu Beverly Hills. Shaun Robinson at the 2008 ESPY Awards. Shaun Robinson at the 10th Annual DesignCure Benefit for the HollyRod Foundation. Shaun Robinson at the birthday party at Blu Beverly Hills. John Salley and Shaun Robinson at the birthday party at Blu Beverly Hills. Shaun Robinson and Nancy O'Dell at the birthday party at Blu Beverly Hills. Natalie Cole and Shaun Robinson at the birthday party at Blu Beverly Hills. 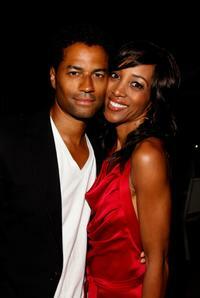 Eric Benat and Shaun Robinson at the birthday party at Blu Beverly Hills. Shaun Robinson and AL.B. Sure at the birthday party at Blu Beverly Hills. Shaun Robinson and Thom Barry at the birthday party at Blu Beverly Hills.